In my presentations to SHRM chapters, churches and non-profits, and basically anyone who needs a good nap after lunch, I regularly warn that even great background checks typically only catch the low-hanging fruit (those whose past offenses have been discovered by employers or law enforcement) and it is important to to have all of your other business controls in place to protect the company, it’s employees and customers, and the public. When an employer gets hit with the double-whammy of a bad background check and no controls, it can lead to the ultimate bad hire day. Enter Elisha Lang. According to court documents, the University of Washington (a state school) hired Lang in July of 2007. At the time, he was facing felony theft charges in King County, Washington (where UW is located), related to a 2004 incident in which he was alleged to have purchased $1,073 in artwork using cancelled credit cards. He also had a 1992 criminal conviction for theft by misrepresentation in Arizona. Employer Lesson #1: The 1992 criminal conviction may not have been reported to the employer because it was 15 years old at the time Lang was hired and the Washington State’s Human Rights Commission generally prohibits the use of criminal records more than ten years old by employers. However, the active prosecution in the 2004 case should have been included in UW’s background check. Some employers unwisely have policies or agreements with their background screening partners that limit the information reported even where there is no legal requirement for the limitation. Did the State of Washington pay for this trip? Elisha Lang’s Facebook profile picture on 9/9/2011. In 2008, Lang was promoted to Administrative Manager to the Executive Director of the University of Washington Medical Center (his business card must have been printed on legal-sized paper). In this position, he was given a UW credit card and through an “oversight” was also granted authority to pay the credit card with UW funds. That’s right, he had the authority to approve payment of his own credit card charges. He was also assigned a UW travel account that allowed him to pay for travel and related expenses. A convicted thief who was at that time being prosecuted for a theft committed with closed credit card accounts is given a credit card and travel expense account with absolutely no oversight. What could go wrong? Employer Lesson #2: A good background check is only one of many business controls that should be in place to protect your assets, people, reputation, and the public. Employees’ personal, financial, and mental situations often change over the course of employment which can lead to unexpected behavior. An ongoing criminal background screening process is one way of ensuring that significant personal issues that may impact the workplace are identified. Financial and supervisory controls should also be in place. Just months before the UW Internal Audit department turned their findings over to the police, Lang entered into a plea agreement with prosecutors on the 2004 theft case and accepted one month deferred adjudication probation on a lesser charge of attempted theft. He completed the probation in March 2010 and the art theft case was dismissed. On April 11, 2011, Lang was charged with 19 counts of theft in King County, Washington related to the UW offenses. That case is pending resolution. When asked if the school ran a background check on Lang before hiring him, a UW spokesman told the SeattlePI.com that a background check had been run but 2009 theft had not appeared because he had not been convicted. Huh? Their background check didn’t reflect the pending criminal case for theft because the case was still active? While Washington State’s Human Rights Commission law does prohibit the blanket exclusion of applicants based on their arrest histories it does not preclude employers from considering active cases that are relevant to the position being sought by an applicant. Employer Lesson #3: Imperative believes it is important that employers understand what information will not be included in their background checks and why. In some cases, legislation limits the information that can be provided to employers. For instance, the federal Fair Credit Reporting Act prohibits screening firms from reporting dismissed criminal cases older than 7 years old, except in circumstances where the individual can reasonably be expected to earn more than $75,000 annually. Washington state has a prohibition on reporting criminal convictions over 7 years old except where the individual can reasonably be expected to earn more than $20,000 annually. In other cases, though, screening firms follow “50-state guidelines,” limiting what they report to employers to comply with the most restrictive state laws (basically – California’s law), without regard to where the screening company, employer, or applicant are located. This invariably leads to reportable but unreported records that may ultimately be relevant to the employee’s role. What’s Up With His Mugshot? In Washington, mugshots are not available to the public, which led me to his Twitter page (tweets protected) and his Facebook page. 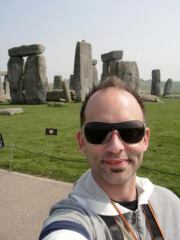 I especially like how the Facebook profile pic is of the guy accused of illegally using his employer’s travel accounts standing in front of what appears to be Stonehenge. Exhibit A, anyone?